Wake up to sales? Download your Freedom Client Funnel Free E-book now To discover our number 1 automated list building and sales funnel program now. If you want to know how to Wake Up To Sales, then the Freedom Client Funnel E-Book will guide you step-by-step through how to build your own automated list building and sales funnel now. How to build a “High-End” Lead Magnet that attracts high-paying customers to you. Come join thousands of entrepreneurs and finally discover how to automate your marketing and sales. Learn the secrets to create a business that can run without you and enjoy the freedom you so richly deserve. Hi, I’m Bret Gregory and I’m passionate about health and wellness and teaching enlightened entrepreneurs how to thrive and grow their business using Facebook. This wasn’t always my life. 8 years ago, I was running a successful financial advisory business that I grew from scratch. I had been in this business for 10 years and while it was financially successful, I was not truly happy, actually I was bored and unfulfilled. I was making money, but I wasn’t making a difference in people’s lives and in the world. This was when a family tragedy altered my life forever. In 2006 my 32 year old brother was diagnosed with terminal lung cancer, and given nine months to live. His passing nine months later was the catalyst for a major shift in my life. I cast off my suit and tie and sold my business. I then took the proceeds of the sale and bought a beautiful property in Costa Rica, and began developing a wellness community that would help people change their habits and live the healthy, natural lifestyles we are meant to. I knew if I couldn’t get customers, I was going to go out of business, so I set out on a mission to succeed and save our new business. I focused on using Facebook to get customers. After a lot of trial and error, and some financial investment I finally figured it out! I quickly grew a page to 200,000 fans, drove traffic to our website and got 2,400 email address opt-ins and make $1.5 million in sales in under 12 months. Now, I teach you, the enlightened entrepreneur how to thrive and grow your business on Facebook. I’d like to show you how to do things effectively the first time around so that you can use Facebook to attract new customers to your business now. 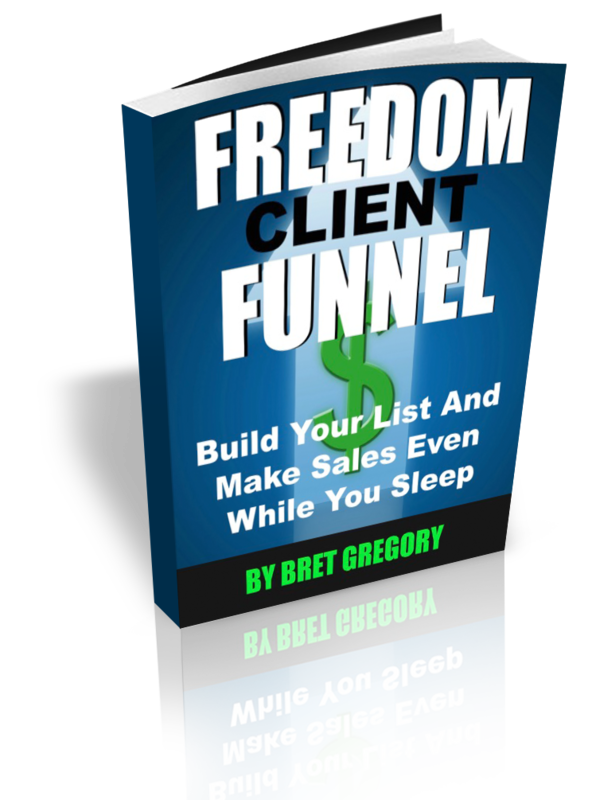 Bret Gregory’s Freedom Client Funnel allowed me to take my list and turn it into cash. In just 4 months I was able to get 1,693 new leads and that led to my first $100,000 month ever! I’m finally growing my list and building my business quickly and in an automated way online that doesn’t take all my time or energy. I recently got 4 new clients investing over $700,000 in assets. © 2017 Bret Gregory. Hi, I’m Bret Gregory and I’m passionate about health and wellness and teaching enlightened entrepreneurs how to thrive and grow their business using Facebook.